Visiting Iran, Pakistan, India, Nepal, Indonesia, Malaysia, Thailand, Georgia and Armenia, Cihan Selçuk Ateşoğlu studied the music culture and instruments in those countries. 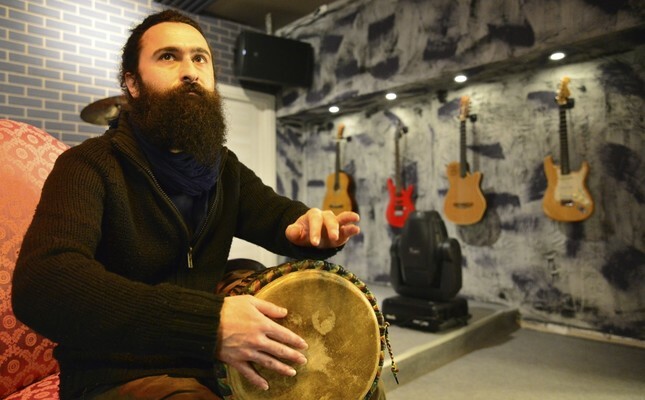 Cihan Selçuk Ateşoğlu from Çanakkale became, so to speak, a "modern itinerant" thanks to the world tour he went on three years ago to familiarize himself with the music cultures and instruments of different countries. Born in Gaziantep, Ateşoğlu dreamed of being well-settled in life with regular work. As a cinema and TV graduate, Ateşoğlu worked as a graphic designer for two years and then moved to Istanbul, where he worked in film as an art director's assistant. As a result of his ever-increasing interest in world music, Ateşoğlu decided to begin working in the area. Hence began his journey and he visited Iran, Pakistan, India, Nepal, Indonesia, Malaysia, Thailand, Georgia and Armenia to study their music culture and instruments, which is also how he was introduced to various artists and hundreds of musical instruments. During his visits, he learned how to play instruments like the sitar, djembe and jaw harp. In addition he can tap out rhythms of strings with a foot jingle. Speaking to Anadolu Agency, Cihan Selçuk Ateşoğlu said that his aim was to share the universality of music with the entire world and interact with various music cultures. Ateşoğlu noted that he transformed into "a modern itinerant" in the last three years, "I started to explore world music while I was working in Ankara. I used to listen to popular music before and I listened to ethnic music. While I was working in Istanbul, I started to attend music meetings. It is quite interesting to witness live performances of experimental music. Then, I bought djembe - which is an African musical instrument - for myself, however, I didn't use that for two years. As I had planned a world trip, I intended to set out. Uprooting myself I left my house and set out. I just took my instrument with me," he said. Ateşoğlu said that his interest in music grew further after visiting different countries. He has developed an interest in archaic music, particularly mystic and ethnic music. "I attend a mystic music festival in Konya and met interesting people there. I visited Asian countries and explored interesting music." Noting that he learned more about world music while travelling like an itinerant, Ateşoğlu said that some people he met during his visits presented him with musical instruments. "Iran, Pakistan and India became the countries where I mingled with musical instruments more. India is an endless country that deserves to be explored. There, I witnessed different lives, instruments and how they are used. They have numerous music schools. People all over the world go there to learn about music," he said. Ateşoğlu noted that he was really inspired by Iran and Nepal and explored the distinct music there. Stating that those countries have music that evolved from geographic differences, Ateşoğlu said: "I found distinct instruments in Nepal and bought some of them. Then, I went on to India. There are so many different musical instruments due to religious differences. You can witness both traditional and experimental music there. I also tried them. "A human life is not enough to study in detail everything. Africa has so many different music genres. They use classical instruments in different ways. People who make music go to different countries, learn various rhythms there and combine them with their own music when they return to their countries. That's what I want to do. I want to go on, get professional and share my music with people. Music makes you familiar with different cultures, different people. It is possible to reach common ground no matter what the issue is. People from various places in the world come together at music festivals. They bring their instruments with them, however, they also try many other instruments. We work together in the name of producing something new together." Ateşoğlu added that he needs friends who can accompany him in his journey and established musicians who can support him.